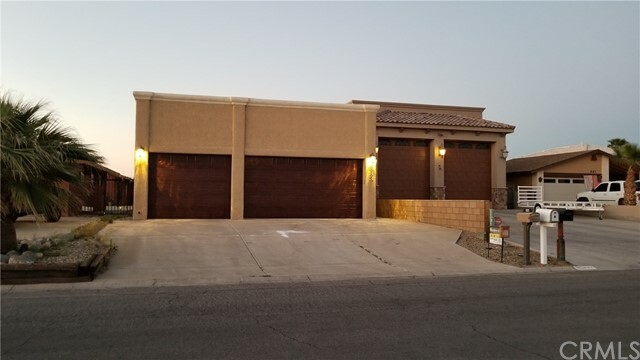 All Bullhead City homes currently listed for sale in Bullhead City as of 04/20/2019 are shown below. You can change the search criteria at any time by pressing the 'Change Search' button below. If you have any questions or you would like more information about any Bullhead City homes for sale or other Bullhead City real estate, please contact us and one of our knowledgeable Bullhead City REALTORS® would be pleased to assist you. "Always wanted your own Colorado Riverfront property? Holiday Shores community in beautiful Bullhead City Arizona and exciting destination close to Laughlin Nevada Casinos and Lake Mohave. Enjoy boating or desert life? Property has a private boat dock on the Colorado River. Home has main floor & lower level -- both have full Kitchens, living rooms, and renovated covered patio decks with new tile and paint. Large bedrooms and open living spaces. Spectacular river, mountain & city views. This Santa Fe style home with 5,306 sq.ft. - 5 Bedrooms 5.25 bathrooms; 4 en-suite master bedrooms with separate bath and shower, inside laundry room, 2 gas fireplaces, 3 new 5 ton a/c units. Long 225 ft. lot with backyard, fenced between home & 4-car boat deep garage with drive-through 3rd door for all your vehicles. Also a workshop with wall A/C in garage. Fenced for privacy and ready for you to enjoy."